Why don't you improve the install process instead of providing documentation? If you have difficulties to install AcyMailing, you may want to try to install it via FTP. This way, Joomla won't have to upload the AcyMailing package on your website so the installation will be much faster. Extract your AcyMailing package in a folder called "acymailing" on your own computer. 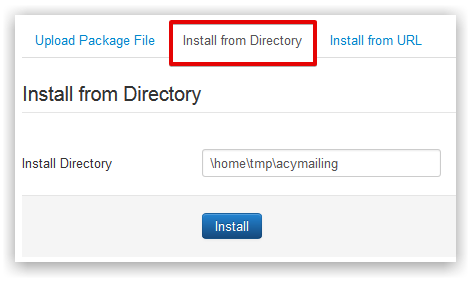 Go to your Joomla Installer manager on your website backend and specify the path of your folder in the input "Install from Directory" : "\home\...\tmp\acymailing". Click on the button "Install"... the install process should be much faster and will enable you to successfully install AcyMailing. A blank page does not help us to determine what could be the problem so if you get a blank page (an entire white screen without anything written on it), please make sure that your PHP configuration enables you to see errors and if not, edit your php.ini file and search for the string parameter display_errors. This parameter should be turned On : display_errors = On. If it's not the case, please edit your php.ini file, modify this line, save your file and then restart your server and try again to install AcyMailing. You should not see a blank screen any more and the error message will help us a lot to fix the problem. You don't have access to your php.ini file? You can also turn ON the Joomla debug mode (Site -> Global Configuration -> System -> Debug System : Yes), it may display an error. If you can not see any error, please try to install AcyMailing via FTP, it solves more than half of the installation issues. This error message is displayed when Joomla can not copy a folder from the temp folder to the destination folder. It's usually because of access rights and you should make sure the AcyMailing folders are writeable (see above). It won't solve the problem but at least if you try to install again AcyMailing, you will see a much better error message telling you what folder is not writeable. That way you can move forward by fixing the permission issue on that folder and install again AcyMailing. This kind of error can be automatically solved by enabling the FTP layer on the Joomla configuration page (or turning it OFF if it was enabled). Then try to install again AcyMailing, you will see a more explicit error message and you can then change the access rights on the destination folder. On J3, you may have the error "copy file failed" when you install an extension. Some folders may not have the right access level. That won't fix the issue but at least you will know exactly what file is causing the issue and you can then check the access level. 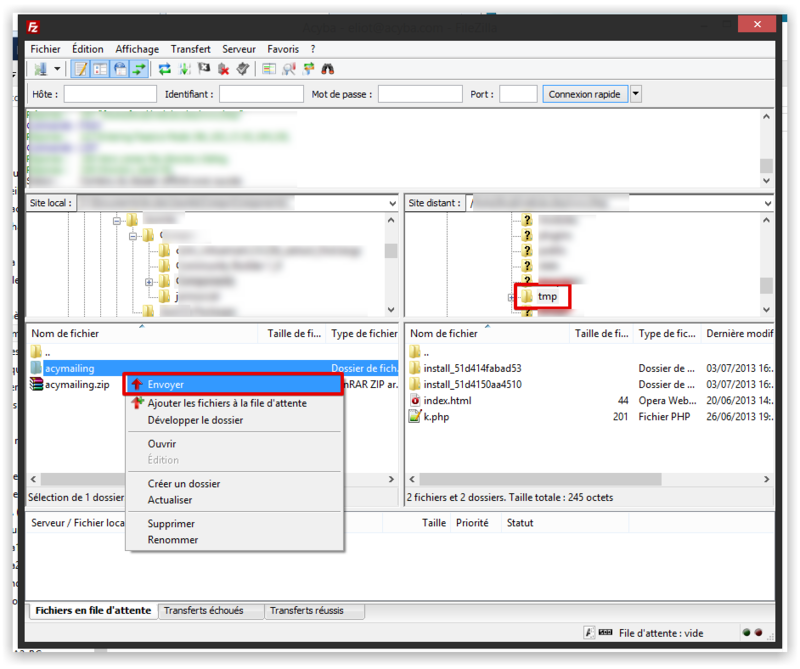 On J3, you may have the error "cannot create destination folder" when you install an extension. That won't fix the issue but at least you will know exactly what folder is causing the issue and you can then check the access level of its parent folder. This error occurs if Joomla can not create a folder. This error can occur if Joomla is not able to copy your package from your computer to your server. It can be because you don't have enough rights on your tmp folder or because your tmp folder is not the right one. So unfortunately it won't fix the problem but if you reinstall AcyMailing, you will get a much better error message. This path should be the absolute path to your tmp folder, it should not be an "http://" link. You can install AcyMailing via FTP, that will avoid that issue but you can also make sure your path is the right one. If you don't know the path you should use, you can try with /tmp which will do the job most of the time. This error can happen if you didn't enter a directory (or didn't enter the right one) if you try to install via the FTP method. Try to install again... you will get a better error message with the path you should normally use if you install via FTP. Apply the exact same modification on line 358. Then try to install again AcyMailing, you will still get an error message but at least you will know what folder is causing the issue so you can check the access right or make sure your tmp folder has the right path. This error occurs when the package could not be extracted and so the XML file is not found. The easiest way to avoid that is to install AcyMailing via FTP. This error is apparently due to the fact AcyMailing could not be installed properly and there are probably still some instances of AcyMailing on your Extensions Manager. Please go on your Extensions Manager (click on the menu "Manage"), select AcyMailing (the component) and uninstall it. Then install AcyMailing again... it should work. AcyMailing will be installed properly but then you won't be able to access it via the components menu on your Joomla back-end. To fix that, you should uninstall AcyMailing via the Joomla Extensions manager. Then install AcyMailing again... it should work and you will new see AcyMailing under your component menu. AcyMailing will be installed properly but you won't see the admin components menu. This solution has been found thanks to this post on the Joomla forum from Lieven Borms. If after installing AcyMailing you have this "404 component not found" error message, you should first try to clear your cache. Access the Joomla Extensions Manager and click on the "Manage" link on the left menu to check the AcyMailing component and make sure the Status is enabled. If you see several instances of the AcyMailing Component there, you may want to uninstall all of them, delete the components/com_acymailing and administrator/components/com_acymailing folders and then reinstall AcyMailing so you only have a single instance of the AcyMailing component. All the above issues occur while installing the Extension. Joomla itself handles that part, not AcyMailing... So the only thing we can do is to provide you with a documentation to help you out.